For anyone who was wondering, yes – this investigation involved Earthdawn elements being carried over into Shadowrun. History doesn’t just vanish – and there was more than one route to survival. The Tomb of Ramesses the Great (what was the matter with these people? Just because it was a translation of a three thousand year old name, why should three or four different spellings all be considered valid?) was fairly impressive. OK, maybe her supply stockpile, and assorted preparations went a bit into overkill – but the way this case was going, she wasn’t going to swear that the tomb wouldn’t prove to be a gateway to a month-long trip through the Egyptian underworld. That didn’t keep Nassor, her newly-assigned government liaison, from giving her some sidelong looks. Well, given that the upper levels of the tomb were subject to regular groups of tourists, and that the whole thing was pretty well explored, he did have a certain amount of justification. Still, she really didn’t expect to find anything on the upper levels. If there was anything, it would be down in the lower levels – the areas that had been opened last, and so were less investigated. Still, Ramesses (or Ramses or whatever) the Great had a hundred or so children, and had lived to close to a hundred – and he’d buried an awful lot of kids and grandkids in his family tomb. The archeologists hadn’t even finished digging out the hundreds of rooms and corridors until 2048, and some of the lowest levels were still partially flooded – and apparently incomplete. It was a BIG tomb. Nassor reported that there were still psychic traces of grief after all this time… Of course, Ramses was a very strong personality, and he buried fifty or sixty of his kids here, and a hundred or so grandchildren. Who knew? Perhaps being worshiped as a god had given him some special power – or at least let him leave one hell of an impression. He’d certainly left enough of one on history, why not on the astral plane? Those traces were oddly mixed by current-day standards – but of course the ancient egyptians had some very strong beliefs about the afterlife. Still, that was nothing that others had not discussed and analyzed before. Yseult headed for the lower levels. They were partially flooded, although it was rarely more than a few inches on the floor, and had mostly been where the grandchildren went… The treasures had almost entirely been looted long ago of course, but most of the remains had been left alone. Unlike in reality, mummies were mostly left undisturbed in Shadowrun history. They never were really worth anything; the thefts were for gold amulets and such in the wrappings. Those weren’t usually used in Shadowrun history – and there were a lot more rumors of actual potent curses. Searching miles of corridors and several hundred rooms took a long time. There didn’t seem to be anything that had been recently disturbed – but one of the back rooms, carefully tucked away down a side corridor, was a little odd. The emotional aura there showed a lot of fear and panic instead of grief – but the room seemed to be unfinished, and looked as if it had never been used. Why such an aura? There didn’t seem to be anything in the place, and there was no reason for it. Hm. No hidden doorways, no apparent false walls, no traps – the archeological records showed nothing but a few bits of scrap material, probably washed in by the water, and a partial version of the usual book of the dead texts showing heavy damage. This last section of the tomb had apparently never been finished, and the burials had stopped when the construction had – probably after the death of Ramses. Nassor stated that there was a distinct impression of sealing charms and such – actual old magic. That was rare to legendary, since magic was pretty nearly impossible at the time. The room dated back to the lowest point of the magic cycle. Laying actual sealing spells would have taken a vast investment of the caster’s personal life energy. What could have provoked that? Inside, the aura was even stronger: panic, grief, guilt, relief, fear… all mixed together. The guilt was the worst though. There were hieroglyphics all over the place, although it looks like the painting was unfinished and damaged. Fortunately she’d picked up the skill programs to let her read them easily. There was plenty of real damage – but the underlying pattern of the areas that had been totally blotted out seemed oddly selective for simply not being finished. This inscriptions were missing the negative confession, the words for passing the gates of the underworld, and the words for opening the gates of life. According to the Egyptian beliefs – or at least the version she had on her skillsofts – if someone had been buried here, those texts would have led him or her into the underworld to be trapped there forever, denied eternity in the fields of the gods. There was no reason why anyone would have noticed that before of course; the hieroglyphs were repeated in every room, so who’d look closely at an unfinished set? There were a few chips of stone on the floor… Calcite, not matching the rest of the room, a bit heavy to wash into a dead end with water, one side polished and curved, bits of a jar or vase? Chips from a canopic jar? Had someone been buried here? Someone… feared or cursed enough to have been hurriedly encrypted, sealed with actual magic at dreadful expense, to have had the workers leave such an aura, and to have been condemned to eternal darkness – and yet someone who’d been formally mummified and buried in a royal tomb, even if it had been abandoned shortly afterwards? Oh, surely Hitoshi couldn’t have turned loose something out of those old “Mummy” movies could he? No, the archeologists had been in this room, and found nothing except the chips (which had been left in situ to await proper cataloging), long before Hitoshi had dropped by. The only thing that they might readily have been missed would be the psychic traces. She had another look for sealed pathways, false walls, or traces of a body. There were some bits of paint on the wall near the end of one text (just after the bit on spells of peace and comfort in the afterlife) that reminded her a bit of that pre-egyptian writing style from the crypt – but that was really reaching. It was only a symbol or two at best, and then only if you did a lot of mental reconstruction of damaged paint. As she’d more-or-less expected, there really wasn’t anything at all substantial. She had Nassor examine everything really closely as well. Outside of the magical traces being remarkably strong for their age and very distinctive (as might be expected from magic powered by personal life-force due to the low magic levels at the time, they carried a powerful personality-imprint of the mage who’d laid them) there was no more to be found. No magical concealment, seals, or anything else – not that any was likely after three thousand years with no active source of magic. There were faint residues of the usual curses and such throughout the tomb – but grave robbers, and thousands of tourists, had worn them to nothing long before the awakening. They might have been potent once, but the priestly curses of ancient Egypt were no threat these days. The other, nearby, rooms in the unfinished section showed no magical traces and few emotional ones. Evidently they really had never been used. No concealed walls there either; the rooms were carved out of solid rock – and the archeologists used some pretty sophisticated instruments these days anyway. Hm. Really distinctive magical traces. Missing body. Well, Hitoshi had apparently found SOMETHING that had led him to the crashed ship – and the only unusual clue she’d found had been the magical traces. It was a guess – but there weren’t that many areas of the tomb that hadn’t been examined by mages yet, and Hitoshi was a mage, not an archeologist or detective. Time to start a search of the area for odd magical traces – and to search the archeological records for unusual stray bodies and for areas that had yet to be examined. OK… The general opinion of the archeologists was that work on the tomb had stopped shortly after the death of Ramses; it was presumed that new tombs were started elsewhere, especially since the new ruler apparently didn’t feel obliged to make sure that each uncle and cousin got a burial in the valley of the kings. Some of the records from the period stated that with the death of Ramses, the tomb had become cursed, with a lost soul wandering it. The priests had supposedly intervened to lay that soul to rest, but the tomb was still sealed. 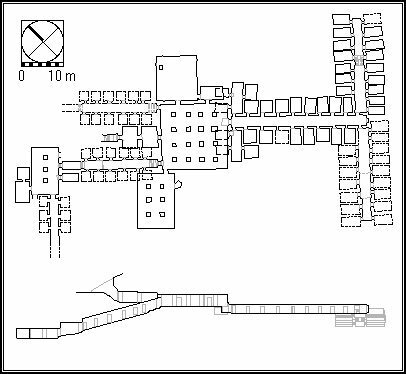 Related areas nearby included a mummification workshop and a selection of several hundred minor tombs for deceased workers – most of them still unexcavated, since they were all pretty much alike and there was still much more exciting work to do elsewhere. Some were officially being preserved intact in case new and improved techniques were available later. Ramses successor, Merneptah, was said to have started his reign by disposing of a possessing demon, which had seized a young prince. No further records were found in that particular sequence had been found – but there were lots of fragmentary records from the period. Ramses had apparently had more than seventy sons, and about as many daughters, and had made funeral arrangements for almost all of them through his nearly 70-year reign. Hm. A “Demon”. A possible reason for a panicky burial, and sealing spells? And for the burial? A prince would deserve his burial, even if a “Demon” could not be permitted into the fields of the gods. Classical “Demons” might not – probably didn’t – exist, but presumably something bloody odd had happened. OK. If the missing body had been mummified there might be more traces in the mummification workshop – and it might be worthwhile checking the workers tombs as well. That would certainly be the easiest place to hide a spare body. Meanwhile, he could run a comparison search for any more specimens of the pre-egyptian text; the archaeologists had compiled a ridiculously massive database of scanned and photographed inscriptions. Nassor did find a few matching traces of ancient blood-magic in the mummification workshop – and was amazed that they had lasted so long. That should not have been possible! Millennia of no magic should have wiped such traces clean – just as should have happened in the tomb really. They started with the newest workers tombs. They’d have been open and easy to get into during the last days of work on KV 5, but were the furthest from the tomb proper – and so had mostly been left undisturbed. The nearer workers tombs had mostly yielded up what little information such tombs could give. There were indeed stronger traces at one of the last of the workers tombs. Even stronger than the traces in the tomb itself. It was unexcavated – but there was a crack about six inches long at one end. There wasn’t much to be seen in the dark – but the crack did look like it might go all the way through into the little workers crypt – and there were a couple of paw-prints, like some small animals had been in and out fairly recently. She had to settle for getting Nassor to use a shapeshifting spell on her. It meant leaving most of her gear behind, but at least her essence-bonded cyberware would shift – even if it would only be to normal flesh. They slipped in one after the other – even if it did take a lot of attempts to get the shapeshift to work on her. Dry and dusty, several ancient bodies long gone to bits of bone, apparently simply wrapped and put into the crypt. There had been no fancy embalming for the common workers. Basic human skeletons, fairly modest damage given the age, it looked like fairly robust specimens for the most part, mostly adult males, two children, three maybe-women. Well, most of the workers would have been unmarried males, so the demographics fit. Dying on the job was presumably something of an honor, since they were digging tombs for the pharaohs. Nothing there that hadn’t been in a hundred previous reports. But, carefully hidden away in a niche back behind the bodies of the workers, there was one small royal mummy-case (child-sized, and probably a boys judging from the face styling – with several sealing spells upon it), some calcite canopic jars (one chipped), and several scrolls of crumbling ancient papyrus. The mummy case looked sturdy enough, although the scrolls were obviously pretty fragile (making them a job for professional help or magic). The mummy case didn’t seem to have been opened or disturbed, although it wasn’t fastened down or blocked in. From the footprints and disturbed dust on the floor, a fox and a human had spent some time by the mummy case – apparently just looking, although it was possible that the scrolls had been disturbed a bit. If so, whoever had done it had abandoned physical investigation when the edges had started to crumble. Fortunately Nassor had a short-range clairvoyance spell (if was often handy in his job with the antiquities department; funny – it was often handy for Shadowrunners too). He could transcribe what was on the scrolls without touching them, and look in the mummy case in the same way – although he wasn’t a specialist in hieroglyphics, and couldn’t easily read them. What little he could make out was interesting indeed – and it looked like it would be safe enough to take a peek into the mummy-case. Nassor said that it was where the traces of old magic were coming from – definitely sealing and binding spells, along with an old curse – but that the spellwork was nothing but traces now. She stood back on guard while Nassor lifted the lid. He was was very careful not to damage anything doing it of course; he was with the antiquities department – but he wouldn’t have joined them without a big bump of curiosity of his own. One small mummy – but a very strange one. The head was badly distorted, it seemed to be hunchbacked, the legs were twisted, the hands were taloned, the arms… were just ODD. The feet seem to have claws as well. It looked like it had been mummified hastily; it was a bit of a sloppy job on the bandages. Well, Nassor’s reaction might be informative. In his job he’d probably seen a lot of mummies. Well, the idea of fame obviously attracted him. It probably would attract an academic. Well, specialist mages made decent money anyway. She offered to let him have all of the publicity in exchange for more of the reward. He could take full credit for finding it – and she could stay out of the spotlight. She didn’t need media attention in her job. Nassor cheerily went for that. As for the scrolls… Transcribing would take forever when she had a perfectly good expert program to read the things. With Nassor’s mending and preservation magic to help it should be safe enough to (very carefully and gently) open and read them. Scroll one was professionally scribed, and quite expensive – a full copy of the book of the dead, suitable as guidance into the afterlife. Scroll two was a special blessing from a priest of Anubis, promising a terrible curse upon whomsoever disturbed the rest of this mummy. It was a lesser version of the curses that were supposed to protect the full royal tombs – and a lot of trouble to go to. Scroll three was an apology to the gods, apparently from a woman, for disturbing the tomb her grandfather had built for his family. She could not bear to leave her son there, to be condemned to eternal darkness, simply because some curse had come upon him – so she broke the seals, and took his body, and placed it in a workers tomb, with a true copy of the book and a true blessing. She took all responsibility upon herself, and asked that any curses that befall apply to her alone. Well, that was sort of sad. Scroll four was a testimony from a priest, who had helped preside at the funeral of Ramses. Ramses surviving family had gathered at the appointed place – the “Eye of Ra”, where the next pharaoh would be chosen. One had received the blessing of Ra – but another, most unfortunately, was cursed and changed. His twisted body was, of course, taken from the Eye of Ra immediately, and screamed for a long time before he died. Still, the priest agreed, that whatever young Amon-Skor’s sin – if it was not the work of some demon and no fault of his at all – at age four it could not be so great as to deserve to be eternally cursed. No matter what his frightened father had said, death in torment was surely punishment enough. For the demon-touched there was an ancient script, which he had included – and there were several lines of pre-egyptian lizard-folk symbols next. Enough for the (very very limited) translation index she and her companions had compiled so laboriously at the crypt-city to get something out of. Some sort of blessing or well-wishing, something about the eternal light of the sun and endless skies. Well, that made sense for a winged quasi-reptilian species – but how had anyone remembered that across ten thousand years? Why would it be considered appropriate for the “demon-touched”? The symbol database did show two strong correlations: the pre-Egyptian symbols showed a match with the remaining bits of symbols from the monolith with the skulls under it at the site of the fallen ship in eight out of twenty-seven positions, with three partial matches where symbols were so badly worn that only a few scratches remained, and no mismatches; everything else was so worn that nothing could be determined. Secondarily, quite a few of the individual symbols matched up with untranslated symbols that were attached to some of the oldest versions of the ceremony of the Opening of the Mouth – a bit of ritual magic intended to allow the spirits of the dead to return to earth. A bit of magic out of legend – and Hitoshi had uncovered evidence linking it to a culture from the last age of magic and to the site of the crashed ship. Evidence that there might actually be something to it – or at least to an older tradition. Well, that explained why he might have gone after it. That kind of knowledge would be a lure for any ambitious young mage. The trouble was, it didn’t tell her much about where Hitoshi might have taken that information; she needed to know more about what the ritual might require – and about what had led him to KV 5. Oh well. Hitoshi had come to KV 5 from a temple near the Great Sphinx – so it was clear where the next stop after this would be if she didn’t turn up anything else. There weren’t any more matching symbols though; just standard hieroglyphs. No secret doors or sealed off areas or anything either – not that she’d really expected anything in a workers tomb. Nassor thought that the note about the “curse” during the ceremony at the Eye of Ra was bizarre – but the evidence of the warped body of some poor kid was right in front of them. Of course, there were a lot of bizarrely warped bodies and deaths during Goblinization – which this somewhat resembled – but it would take exposure to massive amounts of magic to do that, and there was no source of magic like that anywhere on earth during the ancient Egyptian period. Back into the databases to try and find out something about the “Eye of Ra” during the reign of Ramses the Great. Hmm… The “Eye of Ra” was supposed to have been in one of the older temples, associated with the Great Sphinx – but the location was now lost, possibly buried under sand or accessed through the catacombs under the sphinx. According to some records, the Eye had once been a part of the burial ceremonies for an old pharaoh and ascension ceremonies for a new one. It had been believed to judge those who were worthy and unworthy to stand before Ra. It was one of the primary gateways to Manjet, the Barque of Ra, and thus a way for the Pharaohs to ascend directly to immortality upon the boat of a million years. Well, that certainly sounded important – if a bit metaphysical. Still, they were dealing with ancient magic. It was time for more investigation.